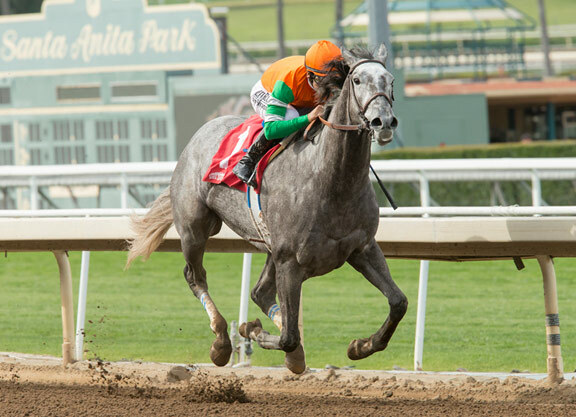 Don Alberto’s “TDN Rising Star” Unique Bella (Tapit) proved superior yet again, albeit a few anxious moments, with a 2 1/4-length victory in Santa Anita’s GIII Santa Ysabel S. Saturday and further cementing her status as the early GI Kentucky Oaks favorite. Away awkwardly from her rail draw, the 1-5 favorite saved ground in fourth in the initial going and floated out a bit on the first turn, pushing her way between Tap It All (Tapizar) and Spooky Woods (Ghostzapper) to take control as they completed the first quarter in :23.35. Running off the rail, the $400,000 KEESEP buy was well within herself and a few lengths clear of the field as she clocked a half in :46.23. GI Starlet S. heroine Abel Tasman (Quality Road) closed steadily on the outside to be second turning for home, and briefly posed a threat to the favorite, but Unique Bella kept on finding, while still under a hand ride from Hall of Famer Mike Smith, to score her fourth straight victory. Off a step slow in her sprint debut at Santa Anita, Unique Bella checked in second after a wide trip that day, but returned with vengeance next out, romping by 10 1/4 lengths at Del Mar Nov. 26 to earn the “TDN Rising Star” moniker. A dominant 7 1/4-length winner of Arcadia’s GII Santa Ynez S. next out Jan. 8, she easily passed her two-turn test, wiring the field by 8 3/4 lengths in the one-mile GII Las Virgenes S. there last time Feb. 5. Click here for a Bill Finley feature on Unique Bella. 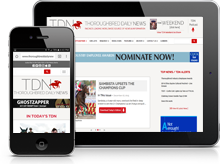 The winner is the second foal, but first to race, out of 2010 GI Breeders’ Cup Ladies Classic winner Unrivaled Belle, who also won that year’s GII La Troienne S. and GIII Rampart S. and placed in four other Grade I events. The 11-year-old mare topped the Keeneland November sale when selling for $3.8-million to Many Pope’s Whisper Hill Farm carrying a full-sister to Unique Bella, who was born Jan. 24. Unrivaled Belle, a daughter of MGSW Queenie Belle (Bertrando), is also responsible for the juvenile filly Relicario (Malibu Moon), a $550,000 KEESEP yearling buy. Click here for a sales feature on Unrivaled Belle. SANTA YSABEL S.-GIII, $100,345, SA, 3-4, 3yo, f, 1 1/16m, 1:43.11, ft.
& Clearsky Farms; B-Clearsky Farms (KY); T-Simon Callaghan. Hollendorfer. $12,000. Margins: 2 1/4, 8, 4 1/4. Odds: 0.10, 5.00, 26.00. Also Ran: Mistressofthenight, What What What, Tap It All. Scratched: Noted and Quoted.